A majority of doors contain one or more glass panels to provide easy vision or in some situations decorative glass can be used as a feature while still letting in light. Regardless of what type of door you have Valiant’s team of glaziers are qualified glass experts and can carry out any door glass replacement. All of our door panel installations comply with the current Australian Standards to provide the ultimate in safety and security for your premises. Besides the obvious function of offering a passage between inside and outside or between two rooms, glass doors can be used to create an open plan effect. Current styles of glass doors include hinged doors, sliding doors and bi-fold doors, which are manufactured in either timber or aluminium frames. Many door styles have slightly different glazing methods however our team can cater for any variation in door type. As doors are classified as high traffic areas that can be susceptible to human impact safety glass is required to prevent lethal injuries causes by broken ordinary glass. The most popular types of safety glass used in doors are clear, tinted or obscure laminated glass. 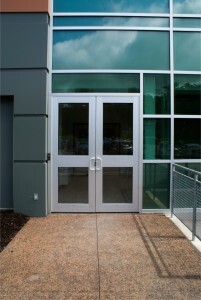 Valiant stocks most types of glass used in doors and can offer same day or next day service where required. Besides the obvious function of offering a passage between inside and outside or between two rooms, doors can be used to create an open plan effect. Current styles of doors include hinged doors, sliding doors and bi-fold doors, which are manufactured in either timber or aluminium frames. Many door styles have slightly different glazing methods however our team can cater for any variation in door type.